Although the FDA officially recognized white chocolate as being chocolate in 2004, the question of its authenticity is still being hotly debated even today. We say, there’s no time for arguing when we could be celebrating National White Chocolate Day in the only logical fashion: by finding the nearest cookie, cake, or even liqueur that includes luscious white chocolate, and basking in non-debatable sweet creamy goodness! ​After 10 years of petitioning by chocolate manufacturers, the FDA finally agreed to expand its definition of “chocolate,” making white chocolate officially a part of the chocolate family. 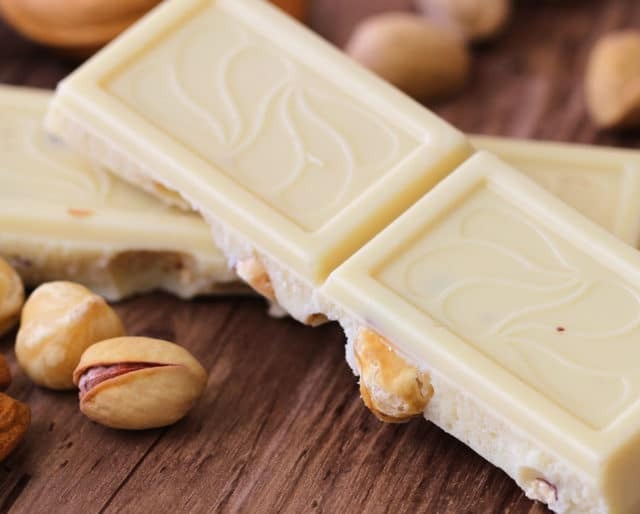 The first mass-distributed white chocolate bar comes to the U.S. The Alpine White bar, a Nestlé product, was released in 1948. While the white chocolate itself was a novelty at this time, the real excitement of the Alpine White was that it included almonds in the chocolate. ​​In the U.S., Kuno Baedeker developed a white chocolate while working for the Merckens Chocolate Company, which still makes chocolate today (and incidentally, also markets other sweet treats like Black Chocolate Wafers). Instead of the usual non-fat, no-sugar-or-cream coffee you dutifully make (and sip with a sigh) each morning, just for this one day, try melting a few white chocolate chips into a steaming cup of cocoa for a luscious alternative. You'll thank yourself (and us) tomorrow, when your usual coffee tastes better than ever. White-chocolate-covered pretzels create the perfect snacking storm: creamy, sweet, salty, crunchy. If you’ve never had this unique pleasure, may we suggest you take this day as permission to tuck in? Although truffles are considered one of the most decadent of all sweet treats, if you’re new to candy-making, truffles are the 101 level. Many can be made by simply warming a white chocolate mixture, forming this into balls, then rolling each ball in coconut flakes, chopped nuts, or sprinkles. (You can also dip the white chocolate balls into melted chocolate before rolling them in these toppings.) Bonus: if you need a quick-but-thoughtful gift idea, this DIY is no "truffle" at all! So why is white chocolate called chocolate? ​White chocolate does contain cocoa butter, which may have been the deciding factor in the FDA's decision to grant it official chocolate status — after a mere 10 years of presentations, pleading, and pressure from chocolate manufacturers. There are good (real) and not-so-good (fake) versions of white chocolate out there, so look for products with a creamy pale yellow color (but no food coloring added), made with at least 20% cocoa butter — less may extend its shelf life, but how long is it likely to sit on a shelf anyway? White chocolate is what makes those novelty coffee concoctions so delicious. It’s a lusciously creamy addition to anything from cookies to frosting. And it fulfills one simple but critical need: what to pair with macadamia nuts. White chocolate does tend to be sweeter than its darker counterparts, so it just takes a smidgen in your favorite dessert recipe to elevate it to Viennese-coffee-house status. Excuse us while we mix up some cookies. With macadamia nuts.